Church Window – God is Watching! This is F-8, Church Window, a paper-pieced block for my Dear Sammy Jane quilt. I started it on Saturday and finished it up tonight. 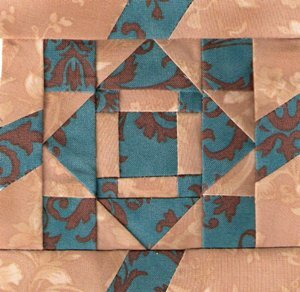 I have now sewn 109 little blocks like this and 15 triangles for the border, a total of 2,499 little pieces of fabric. I am getting ready to machine quilt another top, hopefully starting this weekend. I still have a little marking to do on the lanterns in my “Paper Lanterns” quilt, seen here. This has been a wonderful week for the United States; with a new president and a renewed hope for the future, there have been many times I’ve been close to tears. I feel compelled to comment on a part of President Obama’s Inaugural speech that really touched me. I attended a community college part-time while I was still in high school. I was a music major, and participated in a few vocal music groups. One night after a concert, one of the guys in the group was gracious enough to give me a ride home when my car wouldn’t start. We’d developed a friendship, and he was a good friend going out of his way to help me out. Mom and Dad gave me a huge lecture when I got home; I wasn’t supposed to associate with him because of the color of his skin. I was SO angry! When I went away to college, my parents were also horrified to learn that my roommate was African American. They insisted that I demand a different roommate. I’m happy to say, I refused to do so. Patty and I got along great; she was a year ahead of me, so I learned a lot about being at college from her. I enjoyed her friends, her sense of humor, and the long conversations we had into the wee hours of the night. Everytime I called home or went home for a weekend, I heard the lecture over and over. It angered me. These were my friends… and the beliefs of my parents were NOT held by me. This was the early 1970’s. I was so proud of America on this Inauguration Day. Proud that we had moved past the racist ideas of our parents. Proud that we had come together as a country. Proud of our new President, that he ignored the plea of athiest groups and included scriptural references in his speech. God was present at this Inauguration, just as our forefathers had planned. I know that God was smiling down at our country, and saying “Well done, well done.” Our President is a Christian, eager to move our nation forward along the right path. I’m happy – no, I’m proud to be walking that path with him. And he also said PATCHWORK. What a good man!!! Let the quilting begin! I challenge each quilter who reads this blog to make at least one donation quilt this year. It could be an Alzheimer quilt, a quilt for the Heartstrings Quilt Project, or one of any number of great charity quilt projects listed on Dana’s Quilting For Charity site. As quilters, let’s do our part to help keep America warm. Ready, set, STITCH! I couldn’t be more excited about our new president! I am thrilled that he has been chosen and has now begun to lead our country. He has a tough job ahead but has called on all of us to do our share. And DO we must! I congratulate all Americans, with the hope of many good things to come, with/from President Obama! 😎God bless all!